This is me at my desk today on my lunch break. Notice the small pile of children's books on the desk and the filling recyclable bin on the floor. 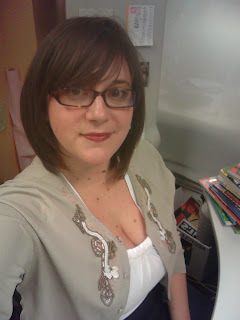 I'm wearing glasses and a cardigan that makes me feel more like a librarian than any other piece currently in my wardrobe. I may look adorable, but I also look like I should have 3 cats at home named Jinx, Einstein and Purrtrude. And maybe it's because I have been overcome by a work project or maybe it's because my head is all twisted around a new thing that I want to be a thing but am not sure is going to be a thing or maybe it's because today is my Friday and I just want it to be time for vacation. But I'm worried that I am going to become the stereotype. Or perhaps I already am. A work project that has me thinking about categories well after midnight. Should I just succumb to my old lady hobbies, adopt a cat and call it a lifetime? Do I just drink tea? A holiday season I am mostly wishing would pass quickly in the night. Being more than a quiet date, a girl you like but don't bring home. How it's going to be disappointing when I finally reach the end of Friday Night Lights. The laundry I must do. So, dear readers, what eclectic list of ponderings keep your mind from resting? The not-so-serious but just might become serious if we let them sit for too long. I shouldn't tell you this, but after Friday Night Lights, I turned to Parenthood. Two of the FNL characters make an appearance eventually. My heart soared. You do look adorbs, btw. I like the extra flair on your cardigan. Actually going to the gym. Those are some things that keep my wheels spinning.